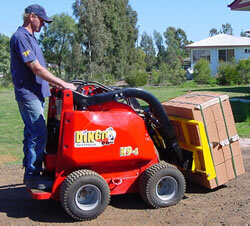 The Dingo Brick Forks are recommended to carry only 1 pack of standard bricks. ie a 1/4 of the pallet. By carry we do not mean lift. To carry, the load should never be raised more than 100mm above the ground. We deliver and pick up for a total cost of $22 within a 10km radius in local Mandurah. If you are outside this area, kindly call for a transport quote.